Manufacturer and Supplier of Prefabricated Industrial Shed. Our product range also comprises of Aluminium Ladders, Polycarbonate Canopy and Fall Ceilings. 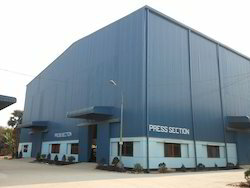 We offering superior quality and effective functioning Prefabricated Industrial Shed for our clients. These products are highly appreciated due to their dimensional accuracy. These are elegance and flexible design for any building needs. These have mechanical resistance, high walk ability and remarkable resistance to corrosion.